Bay Area Digital™, LLC leads adaptive technology companies worldwide in researching, developing and marketing accessible medical products for blind and visually impaired people. We also carry under our name some best-of-breed nonmedical products we believe are of interest and particular use to the community. Below is our current product list, coming directly from us at competitive prices. This is the finest, sturdiest cooking thermometer we've ever seen. It measures from -50 to over 500 dg F, speaks the results in a clear and audible voice, and shows them on a screen that is very readable by a person with low vision. Use it for testing the temperature of meats in the oven, liquid in a pot, or even for making candy. It does it all! 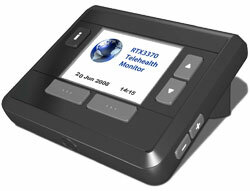 The HealthTeller brings an entirely new dimension to monitoring and changing your overall health! With the HealthTeller, you can hear and read on a large, clear screen the readings from any one of seven different medical-grade health products including a blood pressure monitor, scale, blood glucose meter and oximeter. Not only that, you can have the results from these products stored indefinitely on a secure and personalized website for your review and for review by your healthcare team of professionals. Before purchasing the HealthTeller, contact Bay Area Digital for consultation and additional information. We will help you fashion your purchase so that it meets your personalized healthcare needs for many years to come. 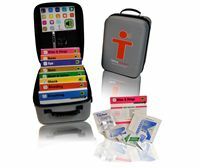 The revolutionary Talking First Aid Kit gives you the resources you need to immediately and confidently react to a medical emergency, and a unique voice technology will guide you through the entire first aid process. Let's face it, accidents can happen at anytime and to anyone. When they do, you can rely on the Talking First Aid Kit to be the voice of reason during those frightening moments that follow the injury. No other first aid kit provides the perfect combination of top medical supplies and clear first aid communication that you can both see and hear. Don't sit by helplessly and wait for an ambulance to arrive. Take action with the Talking First Aid Kit. We'll talk you through it. The Royal National Institute of Blind People has a world-renown array of products to meet the daily needs of people with vision loss. Bay Area Digital is proud to offer a selection of RNIB's products in our online catalog. Click the RNIB Product Detail button to see the catalog.